Stirling (SC104) was the winner of the Phoenix Trophy at the Cowes Classic Week. Adelie(SC64) and Firecracker(SC69) also took part in the event which the Class Captain described as very enjoyable and hopes that the number of Scod entries can be doubled next year. 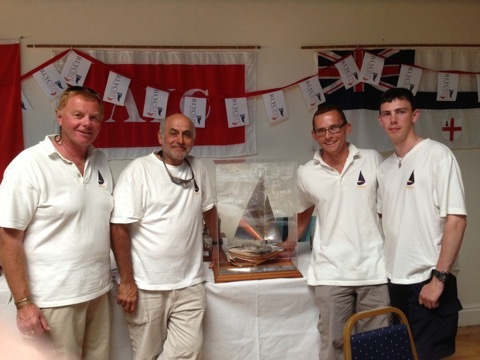 The Phoenix Trophy is a very impressive silver Scod which resides at the Royal London Yacht Club. Cowes Classic Week (2013.cowesclassicsweek.com) is commencing on Monday 15th with 4 Scods entered. The forecast is for a gloriously warm and sunny week albeit with light winds. The Scod Forum is up and running again with improved security software which will, hopefully, help to prevent the spam that has wrecked it over the last few months. Finally, there is a really fascinating and well written account of cruise undertaken by SC48 here. Then known as Portcullis and owned by the Westminster Bank (whose logo was a portcullis), SC48 was originally named Peter Baker a name to which she has now reverted and resides in Auckland NZ. The mysterious name 'Peter Baker' is explained by David Soames, son of the original owner Col 'Bob' Soames. "...My father was frequently asked about the name ‘Peter Baker’ and always remained very coy about it neither confirming nor infirming the various suggestions. One suggestion I seem to remember was that it was in memory of a well-known murderer!! In fact it was very simple. Peter Baker was the WW11 phonetic pronunciation of P B or in other words ‘Phyl’ my mother and ‘Bob’ my father."